He slammed Chris Woakes for 20 runs in one over. Virat Kohli had claimed before the tournament that their bowling attack will dominate this year in the Indian Premier League (IPL). But the way Sunil Narine smashed them in the powerplay might have prompted him to think over his comments. He entertained the crowd to the fullest while he was there in the middle and took the attack to the bowlers of the visitors brutally. However, he slammed the 17-ball fifty in the process and got his team off to a blazing start. While chasing the total of 177, Kolkata Knight Riders lost the wicket of Chris Lynn in the very second over as Chris Woakes dismissed him courtesy a brilliant catch from AB de Villiers. But that didn’t perturb Narine and he belted the same bowler for 20 runs in his next over. While he was there, Narine hit 4 fours and five massive maximums. He didn’t bother whether it was a spinner or the fast bowler and made sure he played with a straight bat to send the crowd into a frenzy. Sunil Narine has been backed by the KKR team management once again to open the innings and he hasn’t disappointed them. Though he is mainly a bowler and was spot on with his line and lengths on the day. He kept Virat Kohli admirably well and went on to disturb the furniture of Brendon McCullum who was looking dangerous. The veteran now in the shortest format of the game has turned himself into an all-rounder and he is making sure that it doesn’t affect his bowling a bit. Narine, however, was dismissed soon after his half-century by Umesh Yadav who castled him off the inside-edge on 50 off 19 balls. But he had done his job more than expected and set his team off to a great start. Twitter and especially KKR fans loved the knock and hailed Narine while trolling RCB brutally for their poor bowling line-up once again. 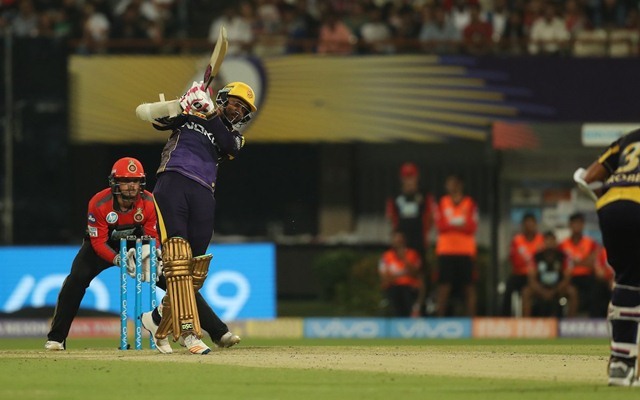 Sunil Narine becomes first player to score half century less than 17 balls twice in IPL history and both came against RCB…. Sunil Narine scored quick runs in Powerplay because he thought Gautam Gambhir is on the other end. Oops! Gambhir: 55 in 42 balls. Imagine if India had Narine instead of Gambhir in 2011 world cup to open. Narine deserves better. Rana with two wickets. Narine with a 50. Sunil Charles Lara dismantling RCB.